On 16 November 2015 the present writer published an article in Australia’s New Matilda magazine. The article had two main objectives. The first was a discussion of the legal bases upon which one State could attack another State. The second purpose was to provide an outline of my attempts to obtain a copy of the legal advice that the Australian government said it would seek before announcing a decision on whether or not to join the United States bombing campaign in Syria. The content of that advice was of considerable interest. The majority of international lawyers doubted that Australia had any legal basis to intervene militarily in Syria. If the government’s legal advisers had a different opinion, then that would represent a minority view and lawyers would have an interest in the basis of their legal reasoning. The Australian government had announced on 24 August 2015 that it would be seeking that legal advice. The clear inference was that no decision would be made pending receipt of that advice. The request under the Freedom of Information Act was refused, but the schedule of relevant documents that were provided (but I was not allowed to see the actual documents) showed that the legal advice had been given to the government on 24 September 2014, eleven months before the Foreign Minister Julie Bishop announced that the advice would be sought. The decision that Australia was going to join the American bombing campaign was announced in early September 2015 and the first bombing was carried out over the weekend of 12 and 13 September 2015. No legal basis was advanced on which this decision had been made. There was no debate in Parliament, but even if there had been it is unlikely that the Labor Opposition would have opposed it given their supine position on all matters relating to “national security”. The only opposition in Parliament came from Senator Richard di Natale, the Green Party leader, and Senator Scott Ludlum, also of the Greens. On 16 November 2015, the day the New Matilda article was published, Ms Bishop appeared on ABC National Radio to announce that the decision to join the US bombing was made in response to a request from the Iraqi government pursuant to the collective self-defence provisions of Article 51 of the UN Charter. That it took two months to even proffer a reason was interesting in itself. In acknowledging in August 2015 that the “invitation” was solicited, there was no mention then of any legal considerations that the government would have to consider. The further issue of how it was legally possible, under international law, for the United States to have any basis of inviting any country to join its bombing campaign in Syria, was never mentioned. It exemplifies the arrogance characteristic of western foreign policy that simply assumes the right to bomb countries, and invite others to do so. Ms Bishop in her radio interview of 16 November 2015 never referred to any American request, or that her former leader had solicited such a request. She preferred instead to claim that the invitation had come from the Iraqi government. For the reasons given below, that claim was in all probability untrue. Ms Bishop’s explanation in that radio interview might have answered the query about the claimed legal basis upon which Australia was going to bomb another sovereign nation put to her by the interviewer. But there were further problems for Ms Bishop and the Australian government. On 20 November 2015 the UN Security Council unanimously passed Resolution 2249. Despite some ill-informed media comment in the mainstream press about this resolution, it was manifestly not an authorization to attack Syria. The Australian government’s first problem then, is that it purports to rely on international law, and in particular Article 51 of the UN Charter. UN Security Council Resolution 2249 did not authorise action outside the terms of the UN Charter. That means that any action would have to be either in self-defence or by resolution of the Security Council. Neither condition exists. That leaves only the notion of collective self-defence. This is the lingering fig leaf of legal respectability that the government clung to, as set out by Ms Bishop in her interview of 16 November 2015. She claimed that Australia was acting at the purported request of the Iraqi government. Confirmation of the Australian government’s reliance upon the alleged request by the Iraqi government is found in the letter sent by the Australian government to the Security Council on 9 September 2015. Such a letter of notification of military action against another sovereign State is required under the terms of the UN Charter. The letter stated that the Syrian government was “unable or unwilling” to prevent attacks from its territory upon Iraq. This is a highly contentious claim, and one that has no foundation in international law. Only two States, The United States and the United Kingdom have officially endorsed the “unwilling or unable” doctrine and their self-interest in doing so is readily apparent. Among the many reasons for its rejection as a doctrine in international law is that it would open the floodgates to the extraterritorial use of force against non-state actors. That it should appear in an official letter from the Australian government to the UN Security Council is surprising. In effect the doctrine is a back door route to avoiding the restrictions imposed by Article 51 of the UN Charter that force must be utilized only in legitimate self-defence or with the consent of the Security Council. The Prime Minister of Iraq’s statement went on to repeat the Iraqi government’s position that it had asked for air support for Iraqi forces operating within Iraq. It further demanded that no activity be undertaken without the approval of the Iraqi government. It would appear that the Iraqi government has a firmer grasp of the limitations on military actions imposed by international law than does the Australian government. That Iraqi government statement is a direct rebuttal of the claims made by Ms Bishop on behalf of the Australian government that the bombing of Syria was at the request of the Iraqi government. Thus, the Iraqi government demolished the remaining tiny element of potential legality for Australia’s actions. This is not the end of the Australian government’s legal problems. The International Court of Justice has on at least two occasions in recent years pronounced that the concept of “collective self-defence” does not apply when the “defence” is against non-State actors. ISIS is not a State in any meaningful sense of the word, so if Iraq had asked for such help against ISIS in Syria, (which as we have seen it did not) such a request would have had no legal basis. The Australian mainstream media had given a small amount of space to Ms Bishop’s original announcement about Australia intending to bomb Syria. 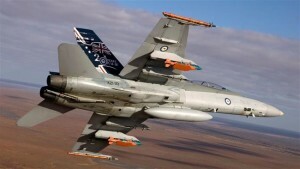 There was also some coverage of the fact that Australian warplanes had carried out operations in Syria when those operations commenced in September 2015. Almost no coverage was given to the doubts about the legality of the air operations after they had commenced. There was no coverage given to the government’s letter to the Security Council and therefore on the contentious claims made in that letter. Neither was any coverage given to the statement from the Office of the Prime Minister of Iraq. To do so would of course have fatally undermined the editorial support for the government’s actions. But there was a further significant development that should have been disclosed by the government and given extensive coverage by the media, and that is the extent of the actual bombing in Syria undertaken by the Australian Air Force. The Department of Defence issues, via its website, the activities of the Air Task Group as it is known, in Iraq and Syria. These data reveal that the F/A-18 fighter-bomber used by the Australian Air Force flew 18 sorties in Syria in September 2015 for a total of 143 operational hours. This was the month the operations commenced. It was also however, the month that the operations initially ended. The Department of Defence figures show that zero sorties were flown in Syria in the months of October and November and 10 in December. Some obvious questions are posed by these data. The first question is why did the bombing cease after the same month it began? The second question is why, given the controversies that surrounds the bombing, were the government and the media totally silent on the fact that the bombing had ceased in October and November? An obvious question is why did the Foreign Minister, in her interview on 16 November 2015, not mention the fact that the bombing she claimed was legally justified had in fact ceased more than six weeks previously? The impression that she strongly sought to convey was that the bombing was both legal and continuing pursuant to the various claims that she was making. The answers to those questions are necessarily speculative, as the government does not see fit to announce to the people to whom it is accountable, what they are doing on such a vital issue. The mainstream media are doing what they always do, which is to avoid printing any material that does not accord with their pre-determined agenda. We do know however, that the American bombing of Syria had been singularly ineffective in diminishing ISIL’s operational capacity. Some commentators have suggested that was precisely the point. Whether Australia wished to continue being a party to that charade is an interesting point, and one that an Opposition and a media interested in the truth should pursue. There was another development at the end of September 2015 however, that has been a singular game-changer in the Syrian theatre of operations. The Russian military intervened in the Syrian conflict. Completely unlike the position of the US “coalition”, the Russians intervened at the specific request of the Syrian government. There was therefore no doubt in international law that the Russian intervention was legally permissible. The Russian intervention, while on a relatively small scale, has been devastatingly effective. Not only were the ISIL forces obliged to seek cover from air attacks, having enjoyed apparent immunity from the Americans and their allies during the preceding 15 months, there was also major disruption of their supply lines. As a result of Russian air reconnaissance and satellite images, it has been established beyond doubt that ISIL was transporting stolen Iraqi and Syrian oil across the Turkish border. That oil was sold on the black market through a company with close links to President Erdogan of Turkey. Military supplies were in turn being shipped back across the Turkish border into Iraq and Syria. There is also good evidence that wounded ISIL fighters are being treated in Turkish and Israeli hospitals. They are also trained in Turkish and Jordanian camps among other places. Both President Putin and Foreign Minister Lavrov have pointed out the financial and other support ISIL receives from other countries in the region. The Australian media have chosen to give only minimal coverage to some of these disclosures and certainly no analysis of their implications. Those interested in discovering what is actually happening in Syria and related theatres of war are obliged to seek that information elsewhere. The Russians have also installed the sophisticated S400 air defence system in Syria. This gives them, and their Syrian allies, the capacity to shoot down any unauthorized aircraft in Syrian air space. Again it is purely speculative, but that may also be a reason why Australian Air Force bombing of Syria, which is manifestly unauthorized, ceased for two months after the Russian intervention. There has now been another new development. The former Defence Minister, Kevin Andrews, sacked when Malcolm Turnbull became Prime Minister in September, complained that Australia should not have rejected a request from the Americans for a greater commitment of troops to Syria. It appears that the replacement Defence Minister, Marise Payne, had rejected such a request. Typically, neither the fact of the request nor that it had been refused were known to the public until Mr Andrews complained. Equally typically, the issue of the legal right of the US to make such a request was never discussed. The fact that it was the Americans who were driving the push for a greater military commitment by Australia did not form part of the letter to the Security Council, and neither was it mentioned b Ms Bishop on 16 November 2015 when she told the ABC why Australia was going to join the bombing of Syria. To stop the illegal bombing was undoubtedly correct from many points of view, not least from the standpoint of international law that Australia has increasingly disregarded in recent years. The great pity is that the Australian government had neither the moral fortitude nor sufficient faith in the Australian people to inform them of the decision to even temporarily withdraw from a war they had no business in pursuing in the first place. Neither have we been given an explanation as to why this manifestly illegal bombing has recommenced, whether it is intended to continue, and if so on what possible legal basis. The original purported justifications have been comprehensively demolished by the subsequent revelations. Whether Mr Turnbull can resist the inevitable pressure from the Americans at his forthcoming meeting with President Obama will be closely watched.